A cream which effectively deals with the problem of acne. Tea tree and propolis inhibits the development of bacteria while panthenol and Aloe vera soothe and moisturize the skin. Apply morning and night on cleansed skin. Propolis: Propolis is primarily used by bees to line up their hives and seal off cracks or holes. It has physical properties that help to keep the cell’s interior free of infectious agents. The interior of the blister is more sterile than a modern operating room. Propolis contains hundreds of compounds, such as vitamins, minerals, amino acids and flavonoids that promote anti-inflammatory, antioxidant, antiviral, antibacterial, antifungal, antibiotic and regenerative properties. Teatree: Teatree’s leaves have been producing oil for centuries to treat skin infections. Tea tree oil contains over 100 active ingredients, which explains the number of beneficial uses. Its most abundant component is terpenes (Terpenes), and this substance has great antimicrobial activity. It also has antiseptic, soothing, anti-inflammatory, disinfectant and healing properties. Daily apply a small amount morning and night on clean skin with gentle circular movements. Avoid eye area. 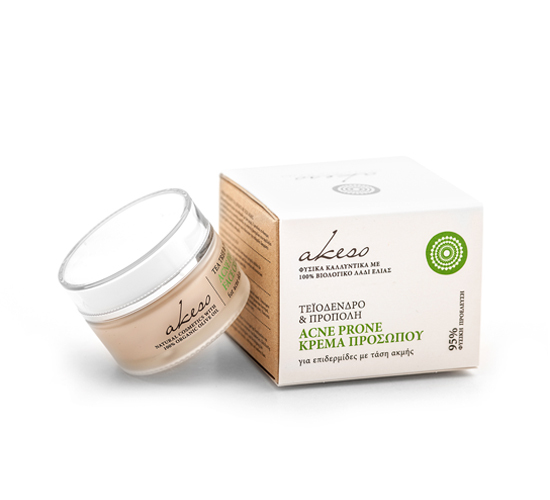 For better results use before the AEKSO extra virgin oil soap with propolis and tea tree.